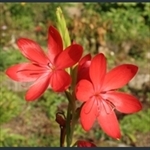 This genus includes the Kaffir lily, formerly known as Schizostylis, with wonderful cup-shaped flowers, usually red or pink, but sometimes white, opening in turn along the upright stems, and appearing in autumn above green, keeled, strappy foliage. Excellent for flower colour at a time when there is not much of it in the garden, and continuing to flower well into winter. Open, cup-shaped, red or pink flowers on tall spikes, late in the year.